90% of families experience losing a child in a public place. 95% will remember forever the trauma of getting lost. 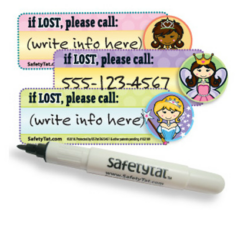 Choose from our range of child safety tattoos, easy to apply, peel and stick, write on information with pen supplied. Last up to 2 weeks! Or choose from our range of Vital ID inside wristbands. 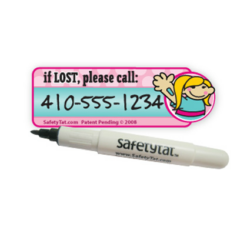 Enables your child to have emergency contact and medical information on them at all times. Eight foods account for 90% of all food-allergic reactions: Milk, egg, peanuts, tree nuts, wheat soy, fish and shellfish. Try these customisable allergy alert tattoos for a fun & cool way (that children love) to remind others and help protect your child from an allergic reaction.